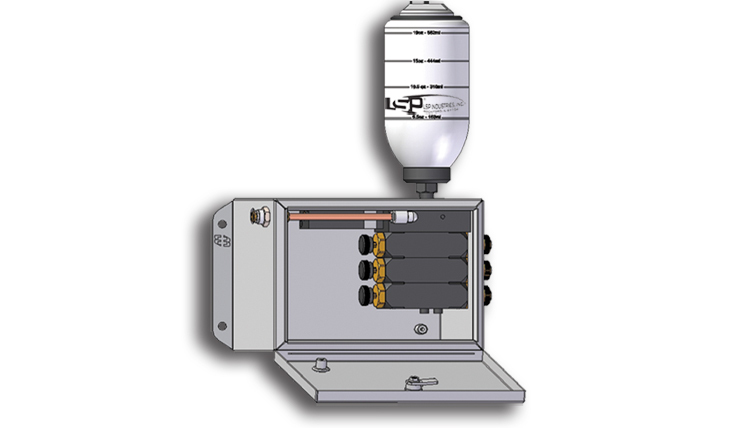 MeterMizer | LSP Industries, Inc.
Lubricant can be dispensed with low velocity air assist or as an airless straight drop. The MeterMizer is used for small controlled amounts of fluid, Micro Dosing, either in a low-pressure spray or a straight drop void of air. The dispersion of fluid is done on an intermediate timed sequence or upon manual command. MeterMizer is a positive displacement pump that can dispense lubricant into a low pressure steam of air or can dispense a controlled drop of fluid, void of air, to the work area. The MeterMizer's unique design allows it to be used in many different applications and is available with one to six ejectors per system. Each ejector comes with 8 feet of tubing and a nozzle mounted on a magnetic base. Reservoirs are mounted on the MeterMizer or can be located remotely from the unit. Each MeterMizer nozzle is supplied with coaxial tubing with one tube carrying low pressure air and the other fluid. 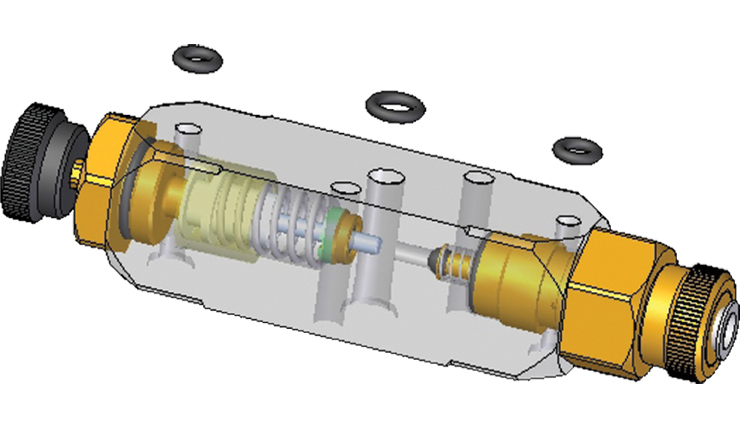 A positive displacement pump injects fluid into the air stream to be disbursed on the work piece. A programmable air timer sets how often the fluid is displaced into the MeterMizer nozzle. This low-pressure type of lubrication is known as MQL or MicroDosing lubrication. 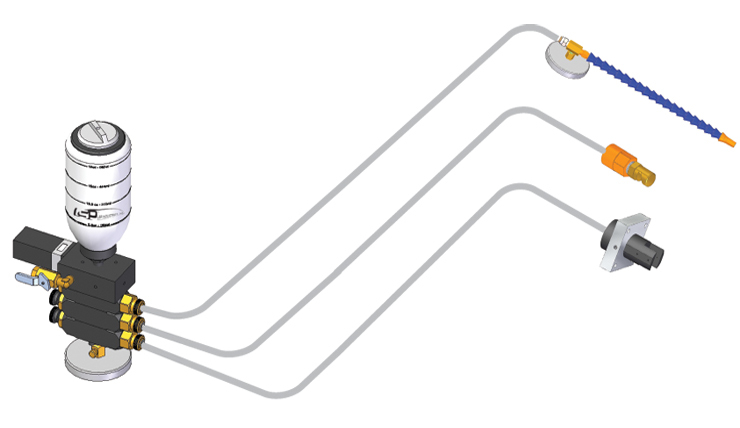 The lubricant moves to the Nozzle tip in measured volumes. When the inner tube is full, on the next pulse, it ejects one measured drop of lubricant into the air stream being expelled out of the outer tube of the Coaxial Tubing. The air and lubricant are carried to the work area. 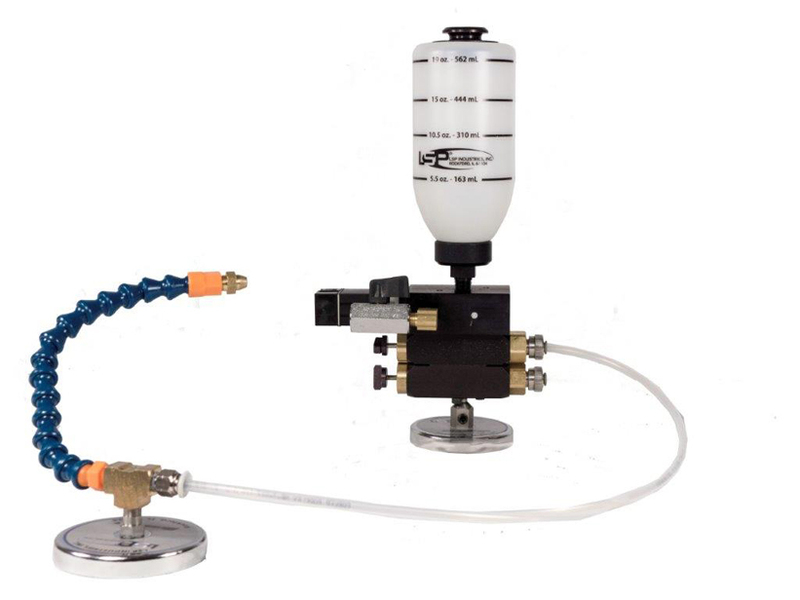 The MeterMizer consists of miniature Lubricant Ejectors, Oscillating Timer, Reservoir, On/Off Valve, Manifold and remote Nozzles with Coaxial Tubing. Lubricant Ejectors, are stacked to the underside of the Manifold. The Reservoir is inserted into the top of the Manifold and shop air enters the On/Off Valve at the side of the Manifold. Nozzle examples shown are (top to bottom)FlexTube Nozzle Assembly, Fan Spray Nozzle, Saw Blade Nozzle. The MeterMizer comes in a great variety of configurations to fit a broad range of applications. Consult the brochure for a complete listing and application details.